Healthcare is on track to become the largest job sector in the U.S. within the next few years, with registered nurses (RNs) comprising the largest group of healthcare providers. In 2014, the U.S. was home to more than 2.7 million registered nurses. The Bureau of Labor Statistics (BLS) reports that the U.S. is now home to nearly 3 million RNs, with a projected 15% increase in employment for the 2016-2026 decade. This, says the BLS, is much faster than the average 7% for all occupations. Within the field of registered nursing, there are dozens of opportunities to specialize with specific patient groups or advance to the highest levels of nursing such as nurse anesthetist, nurse practitioner, critical care nurse, medical-surgical nurse, nurse administration or medical and health service management. Some advanced care nurses, such as nurse practitioners (NPs), choose to open their own practices (currently 22 states allow nurse practitioners to practice independently), while others have their sights set on administration or management. Though the path from advanced care nurse to management, administration or entrepreneurship is shorter than the path for entry- to mid-level RNs, (advanced care nurses already have a Master of Science in Nursing - MSN), entering the business side of healthcare can present challenges. For example, the biggest challenge for NPs entering private practice is making the switch from caring for and educating patients in a hospital or clinic setting to managing the day-to-day responsibilities involved in running a business while serving as the primary health care provider to patients. The good news is RNs who already hold an MSN can earn an MBA in as few as 12 months, while those with a Bachelor of Science in Nursing (BSN) can earn a dual MSN/MBA. The dual option takes less time to complete than taking the two programs separately. 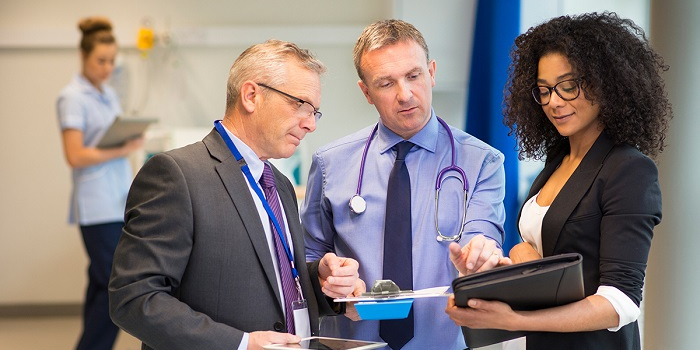 Besides a comprehensive curriculum that can prepare graduates to open their own practices or enter high-level positions such as chief nursing officer, vice president of patient services or chief executive officer, dual MSN/MBA programs often offer the opportunity to gain real-world experience through multiple activities. Students can expect to complete both clinical and business internships, engage in study abroad experiences, and enroll in experiential learning activities locally, overseas or both. And that’s just the beginning! Use our interactive map to find information on schools and colleges offering Online MBA programs in your state and across the U.S.
"15 Highest Paying Nursing Careers [Infographic]." Nurse.org. Nurse.org, 31 Mar. 2017. Web. 09 Sept. 2017. Furlow, Bryant. "Business Advice for Nurse Practitioners considering Private Practice." Clinical Advisor. Haymarket Media, 14 Mar. 2016. Web. 09 Sept. 2017. "Healthcare Occupations." U.S. Bureau of Labor Statistics, Occupational Outlook Handbook, 2016-17 Edition. U.S. Department of Labor, 17 Dec. 2015. Web. 09 Sept. 2017. Japsen, Bruce. "More States Lift Patient Hurdles To Nurse Practitioners." Forbes. Forbes Media LLC, 24 Feb. 2017. Web. 09 Sept. 2017. "Medical and Health Services Managers." U.S. Bureau of Labor Statistics, Occupational Outlook Handbook, 2016-17 Edition. U.S. Department of Labor, 17 Dec. 2015. Web. 09 Sept. 2017. "Nurse Anesthetists." U.S. Bureau of Labor Statistics, Occupational Outlook Handbook, 2016-17 Edition. U.S. Department of Labor, 31 Mar. 2017. Web. 09 Sept. 2017. "Registered Nurses Have Highest Employment in Healthcare Occupations; Anesthesiologists Earn the Most." TED: The Economics Daily. U.S. Bureau of Labor Statistics, 13 July 2015. Web. 09 Sept. 2017. "Registered Nurses." U.S. Bureau of Labor Statistics, Occupational Outlook Handbook. U.S. Department of Labor, 13 Apr. 2018. Web. 09 Nov. 2018. "Registered Nurses." U.S. Bureau of Labor Statistics, Occupational Outlook Handbook, 2016-17 Edition. U.S. Department of Labor, 17 Dec. 2015. Web. 09 Sept. 2017. "Registered Nurses." U.S. Bureau of Labor Statistics, Occupational Outlook Handbook, 2016-17 Edition. U.S. Department of Labor, 31 Mar. 2017. Web. 09 Sept. 2017.